LED dog collars are relatively new to the dog product scene. Many dog owners, including myself, were at first a bit skeptical on the actual usefulness of the collars. Are Led collars just another fad - or is it a product that can make life easier and safer for ourselves and our pooches? 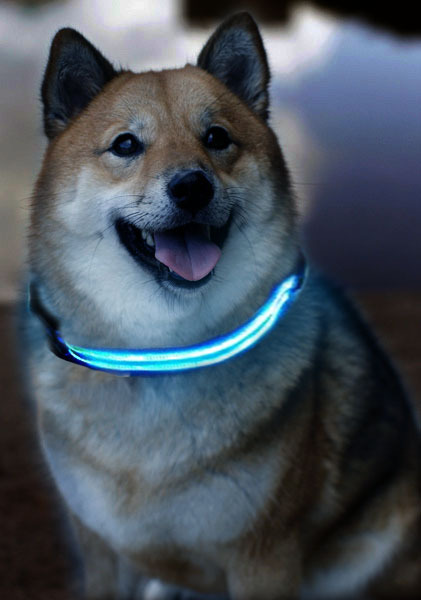 The concept of LED dog collars is great. And they are pretty cool looking as well. The collars are meant to illuminate and bring visibility to your dog while walking in the dark. The bright LED dog collar will alert motorists, pedestrians, cyclists, skateboarders and other typical hazards you might across on your routine dog walk. Read on to see if LED dog collars / harnesses can light up your dog's world! Enhanced Visibility in The Dark - LED dog collars, especially the brightest ones help to increase both the visibility of your dog and the path you are walking on. Walking your dog, even during daylight, can be hazardous - especially in bigger cities. Walking your dog, during the evening, is even more hazardous. LED dog collars offer both you and your dog additional safety that sometimes can make all the difference in the world. LED dog collars also work great for dog owners with expansive yards. Potty trips at night can be frustrating when it's difficult to see exactly where your dog is and if or if not your dog successfully pottied. Bright LED dog collars will help you solve that issue so both you and your dog can get a good's night rest. Additionally, LED dog collars are great for outdoor trips and excursions that both your family and your pooch enjoy together. LED dog harnesses work the same way as LED dog collars but offer almost triple the amount of illumination. So basically you can decide for yourself just how illuminated you want your dog to be. If you think that a LED harness is to bright for your liking, you can simply opt to use your regular harness and get an LED collar. Cool Fashion Statement - While the main function of LED collars is safety, it doesn't hurt that they look cool as well. When Halloween or another festive even comes around the corner, you and your stylish dog will be ready to have a fun and "bright" time! Additionally, using an LED dog collar / harness on your dogs is a great example for others to learn what responsible dog ownership is all about. With safety always being "first" - both you and your dog will be great role models. LED dog collars and harnesses are basically like regular dog harnesses in form and function. The only difference is the added LED lighting. Some LED dog collars and harness have LED lights throughout while others may have LED lights on only certain sections of the collar or harness. Brightness Levels - The brightness level of the LED dog collar or harness depends on how many LED, or light emitting diodes are used and where they are placed. Additionally, some LED collars emit light as individual bulbs whereas other types employ a more "strip" type lighting system. Function - Most LED dog collars / harnesses can be set to steady light, slow flashing, or rapid flash. In most situations, use of steady light is recommended so that the collar / harness does not become distracting to onlookers. Chargeable / Battery - LED collars and harnesses typically come as USB rechargeable units or battery powered. USB chargeable LED dog collars are the more common and preferred type. However, the battery operated units are useful for situations where USB access is difficult or limited. Additionally, the battery life of LED dog collars usually are over the 60+ hour range, while LED dog harnesses can usually last up to 12 hours. Material - LED dog collars and harnesses are either constructed out of a nylon base or made with silicon / plastic throughout. Certain brands of all silicone LED collars such as those from BSeen can actually be cut to size (make sure unit is off). However, instead of cutting, many small dog owners instead wrap the collar around a few times to keep their small dog well illuminated. We prefer the nylon based ones because the silicon type collars / harness tends to attract dog hair - which can be a nuisance with shedding breeds such as Shiba Inus. Water Resistance - Some LED dog collars / harnesses offer water resistance but most are not completely waterproof. Getting a water resistance collar / harness is important because LED connections and water / moisture do not go very well together. The eventual failure of these types of collars / harnesses is usually due to moisture issues and / or biting and chewing. Warranty - Take it from me. LED dog collars will not last forever. Mixing rambunctious dogs with LED circuitry and the elements of mother nature will sooner or later lead to the demise of the product. Fortunately, there are some companies that offer great warranties on their LED dog products. We've listed our favorites below in our reviews. The Ilumiseen LED dog collar is our top choice for LED dog collars. We like the quality of the durable nylon base as well as the brightness of the LEDs. It looks, functions, and feels like a typical dog collar and many might not be able to tell that it is a LED dog collar when it's not turned on. This collar is charged easily by plugging into any USB port. One hour of charge will provide roughly five hours of usage. The collar is water resistant, but as earlier mentioned, it's best to keep LED collars or harnesses away from moisture. However, the absolute best part of this LED dog collar is the LIFETIME guarantee on the product. That's kind of a no brainer there right? Check the availability and latest price of the Illumiseen LED dog collar here. The Blazin' Safety LED dog collar is tied with the Illumiseen mentioned above as our favorite LED dog collar. This flashing LED dog collar has just about the brightest LED illumination from the variety of collars we came across. 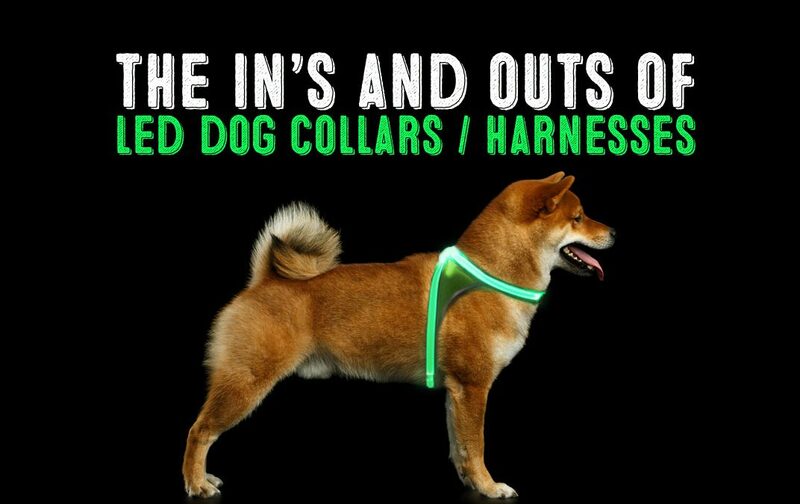 Additionally, the lights go all around the collar for even more brightness and visibility. Compared to Ilumiseen, the nylon collar is not quite as stiff and durable. Though some owners of smaller dogs may prefer this. These collars come in a variety of colors and has three lighting modes: steady, strobe, and blink. Finally, this collar also offers a LIFETIME, no risk warranty. Check the availability and latest price of Blazin' Safety LED dog collar here. The Noxgear LightHound Revolutionary LED dog harness is one of the best LED dog harness available on the market today - and one of the only LED dog harness that we currently recommend. Made with military grade Cordura fabric and 3m reflective material, this harness is durable as well as breathable. It's also machine washable. However, it's not really recommended for strong dogs that pull a lot. Although it used as a harness, it is more of a lighted dog vest in functionality. ​However due to it's breathability, you can use this over a regular harness. The Noxgear LED harness features true 360 degree illumation and fluorescence. You don't even have to choose which color your prefer, because this harness has eight different colors your change at any time. The LED's on this harness is bright and can be seen up to half a mile away. There are six different lighting modes to choose such slow fade, flashing, disco lights, and Photon Burst. Illumination on the harness lasts for over 12 hours on a full charge that is achieved using a micro USB lithium ion battery. Adjusting and putting the harness on is quite easy once you adjust correctly to your dog. The individual harness sizes have quite a range due to it's ability to adjust to various dog sizes. 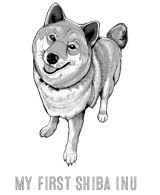 For Shiba Inus, medium is the best size. The warranty for this LED dog collar is one year. You may just have to pay for return shipping. Check the availability and latest price of Noxgear LightHound Revolutionary Illuminated dog harness here. The Pet Industries Reflective Dog Harness is great sturdy LED dog harness at a good price point. Though not as illuminated as the Noxgear LED harness, the Pet Industries harness is a lot more durable due to the thicker nylon construction. This LED harness is charged via a USB cable and each one hour charge will give you about 6-7 hours of continuous use. The design of this harness seems to take some inspiration from Julius K-9 harnesses. This is nice because the design makes it more escape proof than other harnesses. Also, just like the Julius harness, you can customize the harness with a velcro patch. Overall, a great LED dog harness in terms of overall value. Even without the LED light feature, the harness still would be a good value choice. Check the availability and latest price of Pet Industries Reflective Harness here.